We’re somewhat anti-monarchy here in the Professional Moron office. We don’t mean in a French Revolution “Guillotine the buggers!!! !” sort of way. They’re harmless enough, and despite being a bit of a bewildered individual Prince Charles is a likeable chap. So his recent attempt at “doing” the weather for BBC Scotland has gone down a storm on the internet and has swept across the globe. It has also opened up the doorway for bloggers such as us to make merry with a post. And, what ho jeeves, we’re taking full advantage of it! Orignal? No. Fun? Yes. So we take a look at this historic event and wax lyrical! By heck! What an unusual piece of… what’s the word? Promotion? Piece of promotional duty. 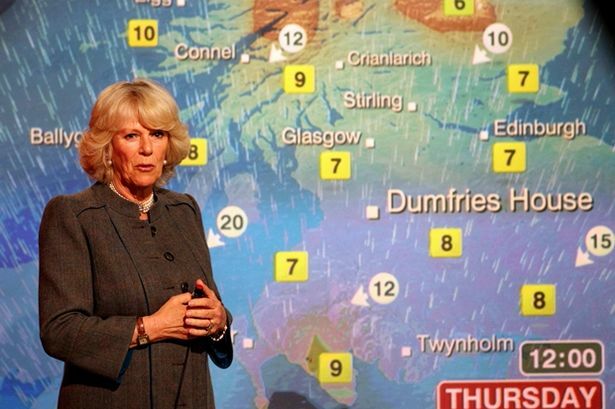 Imagine waking up in the morning with a steaming bloody great hangover and there’s Prince Charles doing the weather. You’d think; “Am I going through a severe batch of delirium tremens?!? !” Then Camilla joined in! Jesus H Christ if ever there was a major mind warp this was the occasion! Just What Was Said. Verbatim? Maybe not. Previous What Would Happen If Mount Everest Fell Over?